Enjoy the comfort, protection and improved visibility that your Tusk vented hard coated poly carb front windshield provides, made from only the highest quality scratch resistant polycarbonate available today. Control the airflow in the cab of your UTV with our easy to operate vent door, open and close without the use of any tools right from the driver’s seat. This item and many other Tusk accessories are manufactured in the USA. I really like my new windshield what a deference it made yes I would recommend, already did. my cuz has a half on his. Great product. The venting system is second to none. Easy to open and close and let's just the right amount of air through for cooling. Definitely recommended. This is a great product that looks very good on my RZR 900 trail. The fit is perfect and was very easy to install. 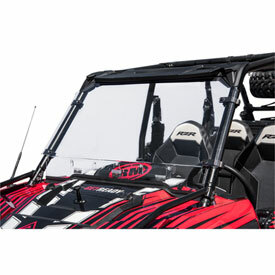 Windshield is easy to install, fit my rzr 900 perfect. The vents let in a lot of air to keep you cool and vent cover does not bounce in open position. Best windshield I have had. Nice. Keeps the dust off of you. Some of the installation instructions are a little hard to understand. This is a great product for the price. There is only one thing I wish they would include with the kit. Rubber isolators to keep the bolt holes from cracking. Other than that, overall great product. windshield fits great and was easy to install, nice quality looking and feeling clamps with rubber vibration dampers. did not rate durability because I have not really cleaned/wiped any major dirt or mud off of it yet. my hope is that it will not scratch as easy as a standard piece of lexan. 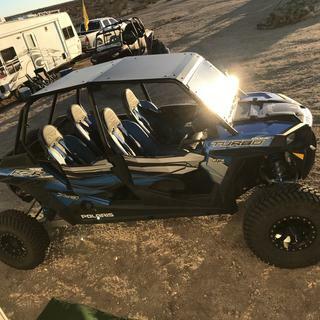 Does this fit 2018 ranger xp 1000 eps? I bought this last year and the bottom seal wouldn’t stay on. how can I get a new seal? BEST ANSWER: I reached out to our Warranty department and they will be sending you a new bottom seal. In the future if there is a problem with any product, please do not hesitate to reach out to our Customer Service Representatives 800-336-5437 and we can further assist you.